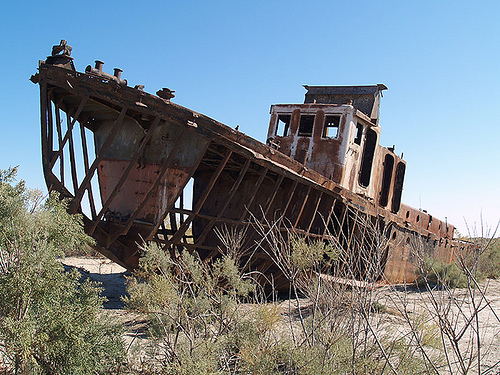 The town of Muinaq, Uzbekistan used to be a port on the Aral Sea, where a lucrative fishing industry used ships like this one. But the fishers and their ships were left high and dry when excessive withdrawals of water from the rivers that feed the sea led it to shrink to a tiny fraction of its original size. Resources are elements of the environment that can be taken and used by people. You are probably familiar with a great variety of natural resources -- gold, wind, fish, etc. Sinks are the capacity of the environment to absorb waste. We can talk about the atmosphere as a sink for carbon dioxide, or a river as a sink for industrial waste. A sink is "used up" when the waste overwhelms the ability of the sink to process it and retain a "clean" state. Thus, for example, the ocean is able to easily absorb small natural leaks of oil -- the oil is dispersed and broken down by microorganisms and chemical processes, restoring the ocean to its normal state. But if a huge volume of oil is dumped into the ocean, as in the case of major spills like the Exxon Valdez or Deepwater Horizon, the ocean's oil-dispersing processes will not be able to handle it all, and significant detrimental changes to the ocean's ecology may occur. Services are things that are done for us by the environment that don't produce consumable resources. For example, wetlands serve an important function in filtering water and absorbing floods. These functions are services provided to us by the wetland ecosystem. Resources, sinks, and services are constrained by the physical environment. But they are also socially constructed. A feature of the physical environment can only count as a "resource" if human societies know about it, want it for something, and have the capacity to extract it. For example, until the development of nuclear technology, uranium was not a resource. Pre-nuclear societies did not have any particular use for the supply of uranium available in the rocks around them. But once a use was found for it in nuclear bombs and power plants, uranium became a vital resource. We can imagine that if in the future the anti-nuclear wing of the environmental movement is victorious, all of our nuclear plants would be dismantled, and thus all uranium would once again cease to be a resource. Another example is the tar sands of northwestern Canada. When oil prices were low, these sands were not an important potential source of fossil fuels, because it was too expensive to extract the usable oil from them. But continuing increases in the price of conventionally-drilled oil, combined with technological advances, are making the tar sands into an economically viable resource. A simple way to look at the geography of resources is to map out where a given resource can be found. The geographical locations of resources has been a significant factor shaping the development of human societies. For example, in our chapter on colonialism, we discussed how Europe's rise to dominance was aided by the presence of silver in the Americas combined with a lack of silver in China, as well as the easier access to coal in Britain as compared to China. But just because a resource is found in a given location does not mean that the people living in that location will be able to access and benefit from it. After all, the silver located in the Americas ended up benefitting European countries located thousands of miles away. The ability to use resources depends as much on the distribution of political and economic power as on the physical distribution of resources. Thus control over resources, sinks, and services is a potential source of major social and political conflict (Gedicks 2001). Figure 1: Solid waste imports into Pennsylvania in 2010 (in tons). This divergence between the location of a resource and access to it occurs in the case of sinks as well. Many of the richer countries in the world are able, due to their wealth and political clout, to access the sinks of poorer countries. Waste produced by the activities of rich country residents is shipped overseas, to be disposed of in far-away sinks (Gbadegesin 2001). This redistribution happens on an intra-national scale as well. 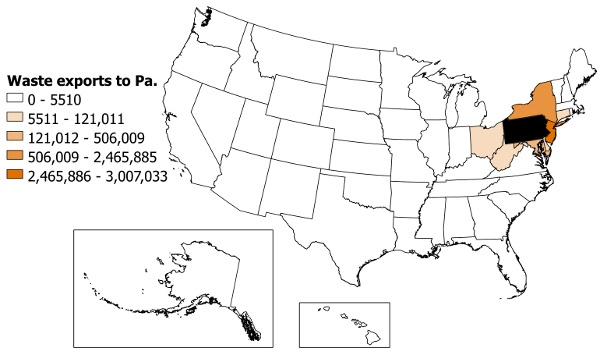 Figure 1 shows the source of solid waste imports into the state of Pennsylvania. Twenty-four other states, plus Puerto Rico and the District of Columbia, access Pennsylvania's sinks for solid waste (meanwhile Pennsylvania also exports a small amount of waste, allowing its citizens to access sinks in neighboring states) (McCarthy 2007). The physical characteristics of the resource itself also matter. One major reason that resources become contentious is that natural systems do not follow human boundaries. The condition of the resources on one person or group's territory can be affected by how resources are used on another's territory. Conflicts resulting from resources crossing human boundaries are called transboundary conflicts. Rivers are a common source of transboundary conflict. Around the world, rivers of major economic importance flow from one country into another -- the Nile in Sudan and Egypt, the Euphrates in Turkey, Syria, and Iraq, and the Colorado in the US and Mexico, for example (Beaumont 1989). Upstream countries often have very different ideas about what they want to do with the water than downstream ones. We can use the Amu Darya, which flows through central Asia into the Aral Sea, as an example (Glantz 1999). The upstream country (Kyrgyzstan) has different demands on the river than the downstream countries (Uzbekistan and Turkmenistan). First, there is conflict over the volume of water each country is entitled to. Each country would obviously like to have as much of the river's water as possible. Upstream countries have a direct advantage in the sense that they physically have the first grab at the water. But downstream countries may be able to use other sorts of leverage (economic, political, etc) to force concessions. Second, the countries of central Asia dispute the seasonal timing of the river's flow. Kyrgyzstan would like to use much of the water for hydropower. This would require releasing large amounts of water during the winter, when electricity demand is high, while slowing the flow during the summer to store up water. Uzbekistan and Turkmenistan, on the other hand, would prefer to get most of the water during the summer, when they can use it to water their crops. The expansion of the modern industrial economy has forced society to confront the possibility that our use of resources, sinks, and services could be unsustainable. Sustainability refers to the ability of a system to maintain itself over time (Nelson 1994). A sustainable use of a resource would avoid degrading that resource so that the current type of use can continue indefinitely. Figure 2: Collapse and recovery of a fishery. In this hypothetical example, the initial steady rate of fishing (effort) takes away more fish each year than are born to replace them, leading to a declining fish population (stock) and therefore a declining amount of fish actually caught (catch). Starting in year 5, the fishers increase their effort to try to make up for the declining catch, but that only makes the problem worse. In year 11, modest caps on how much fishing can go on allow the fish population to avoid being driven into extinction, but the fishers are still hardly getting anything for their efforts. A total moratorium on fishing in years 14-17 gives the stock time to recover, so when modest fishing effort returns the fishers are able to catch a steady amount of fish. 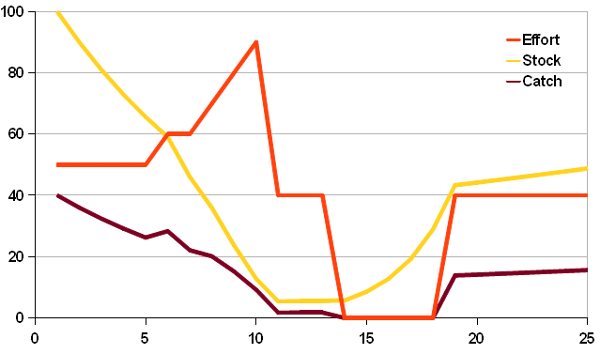 You can try out your own management strategies by downloading the Excel file used to create this graph. Determining how to use resources sustainably requires considering the distinction between renewable and non-renewable resources. A renewable resource is simply one that will replenish itself, while a non-renewable resource is one that will be diminished forever by any use. Thus, gold is a non-renewable resource, because no more gold will ever be made to replace what we mine out of the Earth. Wind, on the other hand, is entirely renewable, because while the amount of wind blowing at any one time may be limited, there is no way we could ever use up so much wind that there would be none left the next year. Likewise, forests are a renewable resource, because given time they will grow back after being logged. Labeling resources as renewable or non-renewable often depends on the time frame we are using. For example, the Ogallala Aquifer in the US Great Plains is slowly recharged by water seeping through the bedrock. On the scale of millions of years, the aquifer is a renewable resource. But current human pumping of water from the aquifer is so massive and rapid compared to the slow recharge that the aquifer is effectively a non-renewable resource for modern farmers (Beaumont 1989). A common principle for using resources sustainably says: if a resource is renewable, don't use it faster than it can be replenished. If a resource is non-renewable, use it in such a way that the profits from using it enable you to find or create some sort of replacement (Norton 1992). The first part should be fairly simple to understand, if difficult to implement in practice. It is similar to the financial rule of living off the interest on an investment, without withdrawing any of the principal, thus allowing the principal to keep generating interest. An illustration of what can happen when a renewable resource is over-exploited is shown in Figure 2. The second part of the sustainability principle could be illustrated as follows: coal and oil are non-renewable resources. But the industrial advances and technological breakthroughs made possible by the use of energy from coal and oil may enable us to transition to alternative, renewable energy sources like solar and wind. Presumably people in England in the 1700s would not have been able to move directly to building modern solar plants and electric cars, so fossil fuels were useful as a bridge. One of the major challenges to sustainability is uncertainty. In many cases, it is extremely difficult to know how our current actions will affect that resource in the long run, or whether alternative actions are worth it. Environmental scientists have made great strides in understanding how natural systems work, but there are still huge holes in our knowledge and our ability to accurately model outcomes is limited (Ludwig et al. 1993). When human systems enter the picture, uncertainty runs even higher. Many scholars and activists propose that when there is substantial uncertainty about whether an activity is sustainable, we should follow the precautionary principle (Harremoës et al. 2002). The precautionary principle says that if there is some reason to think a new policy will be dangerous, we should do something else. The precautionary principle puts the burden of proof on the person who proposes a potentially unsustainable activity to show that their proposal will not be harmful -- instead of forcing potential victims to prove they will be harmed. Proponents of the precautionary principle argue that the possibility of catastrophe is too high to insist that we wait for clear proof of harmfulness of some activity. A key issue in the sustainable management of resources, sinks, and services is how human activities are arranged in space. Where are modifications to natural processes located? How do the demands of human systems line up with ecological processes that are necessary to maintain the very resources that humans depend on? Take for example erosion on Fire Island, New York (Platt, Scherf, and O'Donnell 1999). Fire Island is a low, narrow strip of sand and other unconsolidated material lying off the south coast of Long Island. Natural processes of sediment transport and deposition are moving Fire Island landward and westward over time as sand is eroded from the ocean side of the island and re-deposited on the landward side. Before extensive human development on the island, ecosystems could migrate along with the island's movement. But human-built structures, such as the expensive vacation homes that line much of Fire Island's shore, are more permanent. People want to build their house somewhere and count on it staying there. But erosion, especially during major storms, has eaten away at the beach and undermined many homes. Meanwhile the presence of human development prevents the shoreline dunes from simply migrating inland. In an effort to counteract these natural processes of erosion, Fire Island homeowners have demanded that the federal government invest millions of dollars in beach nourishment projects that dump huge quantities of sand to rebuild the beach in the location it occupied when homes were first built. 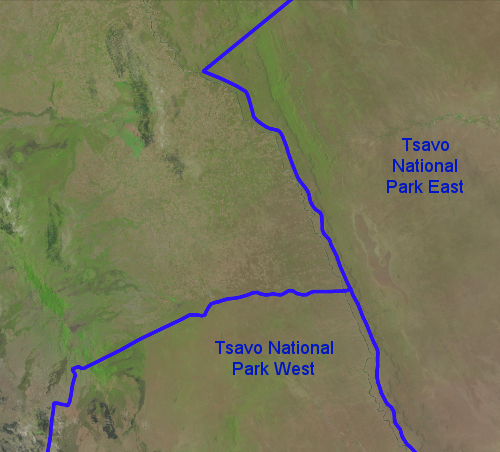 Figure 3: Tsavo National Park, Kenya. The greater prevalence of brown areas within the park has been attributed to elephant overgrazing, while human hunting of elephants in the surrounding area has allowed plant life there to flourish. A common spatial principle for resource conservation is that human activities should be excluded from certain spaces in order to preserve the resources there. This strategy has led to the creation of numerous national parks and other protected areas around the world. At present, 12.7% of land areas and 7.2% of coastal waters are located in such protected areas (UN 2011). But creating national parks is not always a surefire cure. First, the location and spatial arrangement of the preserved land matters a great deal. Many parks are located on land that was left over after earlier resource grabs -- so for example, there are only a few tiny scraps of native tallgrass prairie preserved in the United States because the remainder was plowed up for cropland, while extensive areas of mountain forest have been preserved. Further, the same amount of land will be more effective as a park if it forms a contiguous, compact block than if it is highly fragmented. It also may be the case that resources are not best preserved by excluding all human activity. In many parks, total exclusion of humans has led to destruction of the ecosystem by animals such as elephants or deer whose numbers had previously been held in check by human hunting (Bennett and McGinnis 2008). Moreover, these large stocks of wildlife may wander out of the park, destroying farms or bringing diseases to livestock in neighboring areas (Naughton-Treves 1997). If resources are so useful, it seems like it ought to be good for a society to sit atop a significant resource stock. Some countries have made good use of major resources -- for example, Norway has financed its extensive social welfare state from profits from its extensive oil stocks. Other countries, however, suffer from what is called a resource curse. The resource curse hypothesis says that having a large resource can lead to political instability and corruption, and undermine a country's economy (Auty 1993). A large resource can create one excessively powerful special interest, which can manipulate a country's politics. For example, Australia's mining industry controls a disproportionate amount of its economy, making the industry a powerful political player that can block tax increases to pay for disaster relief or force changes to climate change legislation (Zappone 2010). A major resource also becomes an attractive target for a political spoils system. Whoever can seize power can distribute the profits from the resource to their supporters and cronies, while cutting off opponents from the country's main source of wealth. The focus on one major resource also stunts efforts to expand and diversify the country's economy. Much attention has been given to the concern that wars could be fought over resources. In some cases, wars are fought explicitly to capture needed resources, as in the case of the wars of European colonial conquest. In other cases, a combatant in a war alters their strategy to ensure control of resources necessary to prosecuting the war. For example, during World War II, German attacks on the Soviet Union and Japanese attacks on Southeast Asia were driven by the need to secure access to oil to run their war machinery. Britain took the great risk of converting their navy from slower coal-powered vessels to faster oil-powered ships even though Britain had abundant coal reserves but (at the time) had to import all of its oil (Yergin 1991). Other times violence may be employed to protect valued resources (Neumann 2001). And in some cases access to valuable resources has been able to generate funds that allowed a minor conflict to escalate into a huge, well-armed war. Contemporary wars in the Democratic Republic of Congo, for example, employ arms bought with the profits from tin, tantalum, and tungsten mined in each faction's territory (McHaney and Veit 2009). More controversial is the claim that increasing resource scarcity (due to climate change, depletion of non-renewable resources and overexploitation of renewables, and population growth) is leading to more wars for resources. Many military leaders and analysts have argued for a focus on environmental security, which is the idea that military security requires solving environmental problems in order to head off scarcity-driven fighting (Allenby 2000). Environmental security has been critiqued in two ways (Hartmann 2001). First, some researchers have pointed out that some alleged resource wars were not actually resource-driven. The genocide in Rwanda, for example, was primarily driven by a desire for political power and ethnic tensions, not resource access as claimed by some environmental security scholars. Second, researchers have identified situations in which resource wars occur under conditions of resource abundance. When a resource is abundant, profits from extracting it can be very low, since there is so much of it on the market. In such situations, resource producers may resort to violence as a way of reducing the supply and thus raising their profits (Huber 2011). We can therefore see that resources can play a critical role in military conflict, but a simple equation between resource scarcity and armed conflict cannot be drawn. Finally, note that armed conflict can both degrade and improve environmental conditions. War efforts draw enormous amounts of resources to build and supply military equipment and sustain armies. Production of military materiel can degrade local environments, as in the case of radiation damage to regions around Cold War nuclear installations (Garb and Komarova 2001). And of course the battlefield itself may be a site of resource destruction. On the other hand, persistent military conflict may create no-go zones where resources can recover from human impacts. Examples range from the recovery of bison in areas between the territories of warring Native American tribes in the US and Canadian Great Plains (Flores 2007), to the flourishing of ecosystems in the Demilitarized Zone between North and South Korea (Easen 2003). Allenby, Braden R. 2000. Environmental security: Concept and implementation. International Political Science Review 21 (1): 5-21. Auty, Richard M. 1993. Sustaining Development in Mineral Economies: The Resource Curse Thesis. London: Routledge. Beaumont, Peter. 1989. Drylands: Environmental Management and Development. New York: Routledge. Bennett, David, and David McGinnis. 2008. Coupled and complex: Human-environment interaction in the Greater Yellowstone Ecosystem, USA. Geoforum 39: 833-845. Bobrow-Strain, Aaron. 2001. Between a ranch and a hard place: violence, scarcity, and meaning in Chiapas, Mexico. In Violent Environments, ed. N.L. Peluso and M. Watts, 155-185. Ithaca: Cornell University Press. Easen, Nick. 2003. Korea's DMZ: The thin green line, CNN.com. August 25. Flores, Dan. 2007. Wars over buffalo: stories vs stories on the northern plains. In Native Americans and the Environment: Perspectives on The Ecological Indian, eds. M. E. Harkin and D. R. Lewis, 153-170. Lincoln, NE: University of Nebraska Press. Garb, Paula, and Galina Komarova. 2001. Victims of "friendly fire" at Russia's nuclear weapons sites. In Violent Environments, ed. N.L. Peluso and M. Watts, 287-302. Ithaca: Cornell University Press. Gbadegesin, Segun. 2001. Multinational corporations, developed nations, and environmental racism: toxic waste, exploration, and eco-catastrophe. In Faces of Environmental Racism: Confronting Issues of Global Justice, eds. Laura Westra and Bill E. Lawson, 187-202. Lanham, MD: Rowman and Littlefield. Gedicks, Al. 2001. Resource Rebels: Native Challenges to Mining and Oil Corporations. Boston: South End Press. Harremoës, Poul. et al., eds. 2002. The Precautionary Principle in the 20th Century: Late Lessons from Early Warnings. London: Earthscan. Hartmann, Betsy. 2001. Will the circle be unbroken? a critique of the Project on Environment, Population, and Security. In Violent Environments, ed. N.L. Peluso and M. Watts, 39-62. Ithaca: Cornell University Press. Huber, Matthew T. 2011. Enforcing scarcity: oil, violence, and the making of the market. Annals of the Association of American Geographers 101 (4):816-826. Ludwig, Donald, Ray Hilborn, and Carl Walters. 1993. Uncertainty, resource exploitation, and conservation: lessons from history. Ecological Applications 3 (4): 547-549. McCarthy, James E. 2007. Interstate Shipment of Municipal Solid Waste: 2007 Update. Washington, DC: Congressional Research Service. McHaney, Sarah and Peter Veit. 2009. Stopping the Resource Wars in Africa, World Resources Institute. August 10. Naughton-Treves, L. 1997. Farming the forest edge: vulnerable places and people around Kibale National Park, Uganda. Geographical Review, 87(1): 27-46. Nelson, Robert H. 1994. Sustainability, efficiency, and God: economic values and the sustainability debate. Annual Review of Ecology and Systematics 26: 135-154. Neumann, Roderick P. 2001. Disciplining peasants in Tanzania: from state violence to self-surveillance in wildlife conservation. In Violent Environments, ed. N.L. Peluso and M. Watts, 305-327. Ithaca: Cornell University Press. Norton, Bryan. 1992. Sustainability, human welfare, and ecosystem health. Environmental Values 1 (2): 97-111. Platt, Rutherford H., David Scherf, and K. Beth O'Donnell. 1999. Fire Island: the politics of coastal erosion. In Disasters and Democracy: The Politica of Extreme Natural Events, ed. Rutherford H. Platt, 167-214. Washington DC: Island Press. Rudel, Thomas K., Oliver T. Coomes, Emilio F. Moran, Frederic Achard, Arild Angelsen, Jianchu Xu, and Eric F. Lambin. 2005. Forest transitions: towards a global understanding of land use change. Global Environmental Change 15: 23-31. United Nations 2011. The Millennium Development Goals Report 2011. New York: United Nations. Yergin, Daniel. 1991. The Prize: The Epic Quest for Oil, Money, and Power. New York: Free Press. Zappone, Chris. 2010. Australia at risk of missing out on green economy: Stiglitz The Age, July 29.